All boys in VI-1 and below must learn a Declamation. Minimum length ~ 250 words. Maximum length ~ 5 minutes. Nothing from plays being put on at Radley this year. Extracts from longer works are allowed. No pieces in languages other than English. These are the rules of Declamations in 2018, but it has taken 170 years for them to reach this format, and they will undoubtedly change again. Over the last few years, the influence of Youtube has meant that many contestants have researched classic performances, many more pieces are taken as monologues from films, and performance poetry and poetry slams are beginning to feature in the finals. So even something so apparently fossilised in tradition as Declamations is evolving before our eyes. It was William Sewell who started ‘Declamations’ at Radley. He had published in 1846 a book of extracts for declamation in schools called The New Speaker and Holiday Task Book, which was widely advertised in The Spectator, and which pre-dates the founding of Radley in 1847. This was part of Sewell’s drive to encourage public-speaking. As Warden in the 1850s, he encouraged the Fellows to give talks to the boys on Friday evenings; these meetings came to be known as the ‘-ologies’. Amongst rather unusual subjects were lectures on Fortification by Florio Hutchisson (the drawing master), and cooking lessons for the Military Class conducted by Felix, the Belgian chef. The editors of The Radleian enthusiastically recorded the performers and performances throughout the 1860s. But Wardens change and times change with them. By 1871, Charles Martin had a larger school to govern and with it, less time for family or country-house style entertainments. 1877 saw the abolition of Recitations at the All Saints’ entertainment, in favour of a plain concert; and resentful Old Radleians complained that this new man in 1872 had actually made Recitations compulsory for all, to be done by forms in School to a mere audience of boys, with none of the All Saints’ glamour. 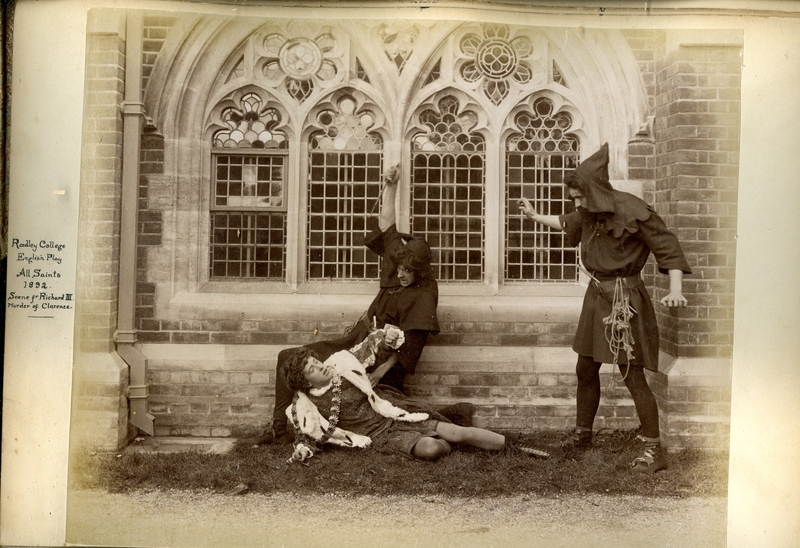 Recitations returned for All Saints’ Day of 1880, but the Warden had bigger ideas; and in the following year the first Latin play, the Andria of Terence, was performed. The programme included also extracts from Shakespeare and Moliere a form of entertainment which was to last till 1900, when the first Greek play was produced. Other Latin plays performed later included the Adelphi and Phormia of Terence, and the Trinummus, Aulularia and Captivi of Plautus. A Latin prologue, spoken by the Senior Prefect (the less erudite with the text secreted in the College cap), introduced the performance. Charles Vincent, who became the first Tutor of B Social, wrote the first prologues; they referred to the outstanding events of the year, and increased in length as the years proceeded. The plays were elaborately staged at the east end of the Gymnasium (now the Coffee Shop). Declamations has been performed continuously at Radley since the 1940s. Its format has changed. 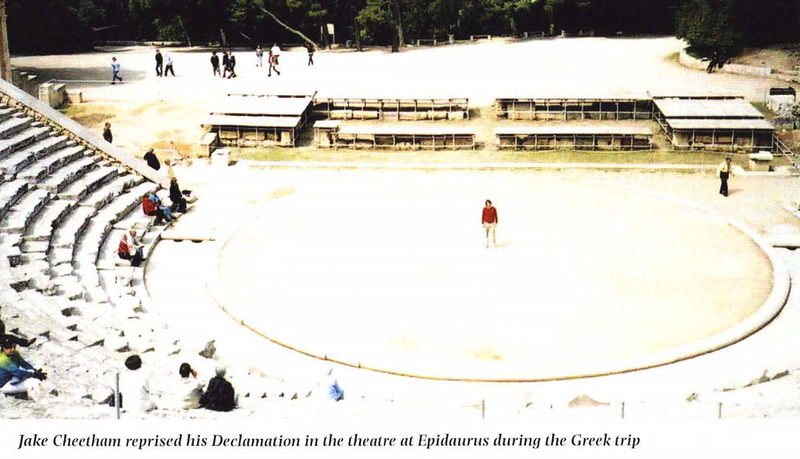 In some years the different year-groups performed their Declamations in different terms. Judges have ranged from distinguished Old Radleians to Ted Hughes whilst Poet Laureate. In the 1980s the reprise was introduced, at which the winners and runners-up in all categories, performed again to an invited audience: in 2014 David Coulton, former Chaplain, donated a cup for the Victor Ludorum. In the 1990s, Declamations in French was introduced. In the same decade, Alex Allen became the first boy to win in all five years of his Radley career. He stressed the need to communicate the mood, shape and sense of the poem or passage being recited: this requires “courageous concentration” and respect, for the poem”means more than you”. One’s aim should be to “evoke an atmosphere around the poem” ,and in recitation “a poem needs to grow, and develop, to be sustained to the end.”In order to communicate, as in the theatre speakers should look “at their audience, not up or down”; “take their time”; “speak up “but not “push the poem”; “respect punctuation “rather than ignore it so that they mangle the meaning; and perhaps first and foremost spend time finding a good poem. At the beginning of this article, I stated that the Recitations grew out of a particular method of schooling: the memoriter, in which boys frequently learned large sections of text by heart to recite accurately in class. Recitations developed in a world where memory was trained from an early age. In the days of the internet, memory is becoming used less and less as a learning tool, and the skill of remembering large sections of text is no longer taught. Declamations Day brings those skills back into use.